I love M. Night Shyamalan's work. He wrote and directed "Signs", "The Sixth Sense" and "Unbreakable". Unfortunately he also did the same for "The Happening", "The Village" and "The Last Airbender". 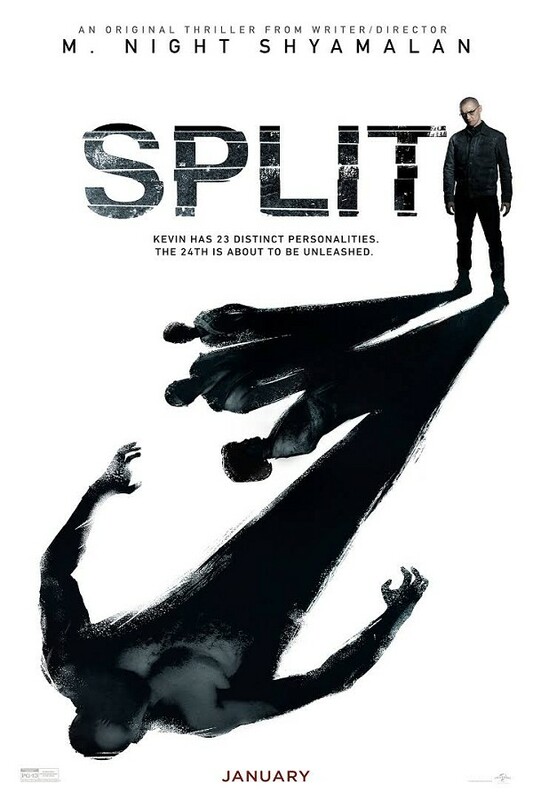 His newest movie "Split" shows he hasn't lost it. What an intense, satisfying movie. After we walked out of the theater my son said, "So do you want to go get coffee someplace so we can talk about it?" A sure sign of a good movie. James McAvoy plays the main character(s). Kevin has been diagnosed with 23 distinctly different personalities. One of the personalities kidnaps three high school girls and holds them for a newly emerging personality, The Beast. McAvoy's acting is excellent. He makes you see all his personalities as different with the bare minimum of costume changes. The three young girls are strong willed and fighters. Casey, played by Anya Taylor-Joy, is quiet and withdrawn but becomes the strongest. She has flashbacks of an abusive uncle which are distracting but give important clues to her own personality. Haley Lu Richardson is Claire and Jessica Sula is Marcia. The main cast is rounded out by Betty Buckley as Dr. Fletcher, who is Kevin's therapist. It isn't a real horror film as much as an intense psychological thriller. It is extremely good. Be prepared to talk about it afterwards. You'll have to. So go. Have fun. Eat popcorn.